of cellular fatty acids (GC-FAME). The original product was named the HP Microbial Identification System and released in 1985. By 1987, Dr. Sasser gained full rights to the technology and in 1991 founded MIDI and the Sherlock brand name, the Sherlock™ Microbial Identification System (MIS). By 1998, the U.S. Centers for Disease Control and Prevention (CDC) recognized the Sherlock MIS as an official method for aerobic bacterial identification (CDC-NIOSH Method # 0801) because of the system's ability to rapidly identify a wide range of bacteria. In addition, the Sherlock MIS gained AOAC INTERNATIONAL clearance in 2005 for the confirmation of the anthrax pathogen, Bacillus anthracis. In 2017, the Sherlock platform was extended to Shimadzu Corporation's GC-2010/2030 product line and to non-microbial solutions (e.g. Marine oil analysis). The Shimadzu version is called The Sherlock™ Chromatographic Analysis System (CAS), keeping in line with MIDI's evolving mission to provide automated chromatographic solutions beyond microbiology. The Sherlock™ Mycobacteria Identification System (MYCO-LCS) was released in 2003 and represents the only commercially-available mycobacterial identification system that analyzes mycolic acids by HPLC. The Sherlock MYCO-LCS represents a rapid, accurate and comprehensive solution for the identification of over 60 mycobacteria and related species in the following genera: Corynebacteria, Dietzia, Gordonia, Nocardia, Rhodococcus and Tsukamurella. The Sherlock MYCO-LCS is currently used in the U.S., Western Europe and China in leading respiratory hospitals and public health labs. To provide automated chromatographic data analysis solutions to the most complex chromatography challenges. President, CEO & R&D Director of Laboratory Research - Myron Sasser, Ph.D.
Dr. Myron Sasser founded MIDI in 1991 and has more than 40 years of experience in microbiology and fatty acid-based microbial identification in particular, with numerous published articles to his credit. He has led the R&D efforts at MIDI since its inception, resulting in numerous patents and products. Prior to MIDI, he was a Professor of Plant Pathology for 20 years at the University of Delaware (UD, 1968-1988). During his tenure at UD, he developed the first microbial libraries for HP's Microbial Identification System. In 1987, Myron gained the rights to the fatty acid-based technology behind HP's Microbial Identification System and MIDI and the Sherlock Microbial Identification System were created in 1991. Myron earned a B.S. in Horticulture / Chemistry, an M.S. in Vegetable Crops and a Ph.D. in Plant Pathology, all from the University of Florida, Gainesville. Gary Jackoway has more than 30 years of experience in a wide range of software development projects, including development of MIDI's Sherlock Operating Software user interface and libraries. Prior to MIDI, he worked for 20 years at HP as a Software Engineer, leading the development of the first and subsequent generations of ChemStation software. Gary earned a B.S. in Mathematics from Stanford University and an M.A. in Computer Science from Duke University. 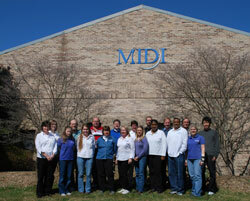 MIDI has been a Premier HP & Agilent Technologies Channel Partner since 1991. MIDI has been a Shimadzu Scientific Instruments (SSI) Partner since 2016.